Please sponsor me for the Aon Benfield Paris to London bike ride I’m doing (with 200 of my work colleagues). I’ve chosen to ride for MapAction, the disaster mapping charity which I volunteer for. MapAction relies heavily on donations to be able to continue their work in disaster affected areas and disaster prone countries. You can sponsor me on the giveall website where we have a page set up especially. Click the Sponsor me now button. Make sure you mention you are sponsoring me otherwise the money won’t go to MapAction! Any amount of money you can spare would be very much appreciated. 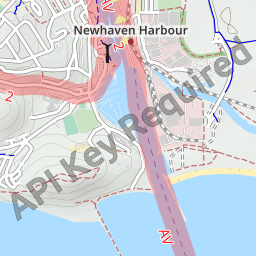 (an image from OpenCycleMap of Newhaven – the port we enter before cycling back to London). MapBox have published a very slick looking 2013 OSM data report. It looks like it uses HTML5 to show some lovely looking animations (timesliders etc.) of different aspects of the OSM data (data updates etc.). The stand out stat for me is that about 40% of changes are made by 0.1% of users! There are some very dedicated OSM people out there and we should say a big thank-you to them! There are also over 1 million users now, helping to bring better data to OSM every day. Yippee! P.s. thanks to Nick for this info.